A lot of Too Fast's clothing is really tattoo/rockabilly oriented, not goth. But I know there can be some crossover between the two subcultures. Here's a nice skull sweater that would be cute for fall. I love the peekaboo sleeves! 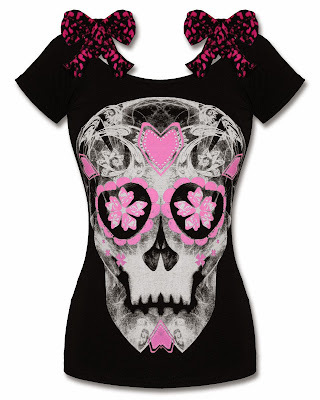 Too Fast's Annabel Sugar skull shirt has cute bows at the top of it. Might be too pink for some people's tastes though. This strange shirt is called Ms. Skunk. This shirt is Too Fast's "Amadeus."